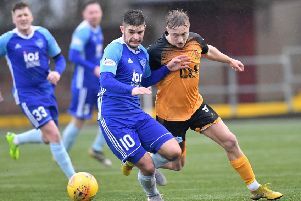 Patience proved a virtue for Peterhead as they overcame stubborn Albion Rovers to get their drive for promotion back on track. Second half goals from Ryan Dow and Russell McLean earned the points for Jim McInally’s side at Cliftonhill. The Coatbridge stadium may be referred to as The San Siro by the somewhat tongue in cheek Rovers match day announcer. But there any resemblance to a glamorous footballing venue ends. And sadly for the 332 spectators the fare on offer in the first 45 minutes was entirely in keeping with the surroundings. Dire. Rovers were commendably enthusiastic, but otherwise limited and other than some dangerous balls into the box by right back Michael Hardie offered little to stretch the Peterhead defence. Not that the Blue Toon were any more potent at the other end. An early back injury to Rory McAllister didn’t help their cause. But a McAllister shot which trundled well wide and a Cameron Eadie header equally lacking in accuracy were the sum total of their efforts in a forgettable first period. The second half had to be better and it was. Not by a lot, but it was better. A goal was always going to help and it arrived on 49 minutes. Rovers’ trialist keeper to punch clear a Jamie Stevenson cross but only succeeded in sending the ball upwards rather than outwards. And as it dropped Dow showed commendable bravery to get to the ball ahead of the keeper and nod into the net. Home heads dropped as Peterhead seized the initiative and Derek Lyle might have doubled the lead soon afterward. But his lob from the edge of the box just failed to clear the keeper who, backpedalling after being forced to come out to clear from Dow, grabbed it gratefully. Rovers did conjure up a couple of promising positions, but their former defender Mick Dunlop was there quickly to snuff out the danger. 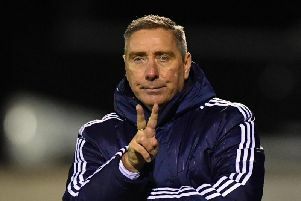 And any remaining doubts over the outcome were wiped out by a second Peterhead goal on 70 minutes. The home fans howled for a free-kick during a Peterhead attack, but referee Alan Newlands was of a different opinion. That, effectively, was that. and McInally’s men saw out the game in a degree of comfort somewhat at odds with their spartan surroundings.